I've been using a Word Wall with my high school students for 9 years now, and the results have been incredible. I have 90-minute classes, so I'm able to give my students 8-10 minutes of free reading time each day. I put this time at the BEGINNING of the class for several reasons. 1. I express that free-choice reading is SO important in helping students with many aspects of their personal and student life that it deserves to be first in my class. 2. If you save it for last, students will be more likely to talk and not read. 3. It settles a class down and sets the vibe for the remaining portion of the class. 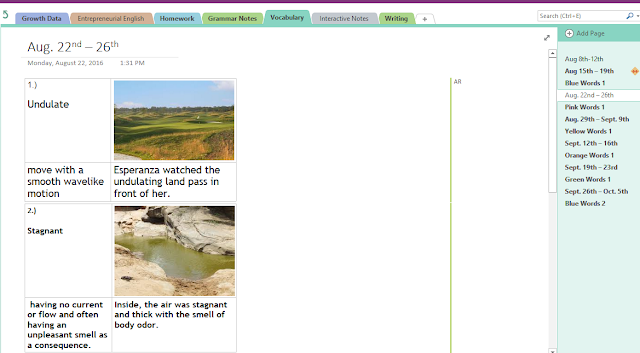 If you would like this strategy, plus more vocabulary strategies for classroom OneNote, follow my OneNote Pinterest Board and download my free vocabulary notebook found in my collection! By finding a new word each day, they will end up with 5 new words each Monday. It is on this day that I walk around the room and pick out the best of the best words. As I'm walking and checking work, I keep students busy by practicing roots words or reviewing their former words (more on this in a minute). I will ask the students with the best words to go up to my computer and type in their word, part of speech, sentence, and definition. I repeat this for all 3 classes (I'm on a block schedule) and end up with around 15-20 great words and sentences from YA books. I personally narrow these down to the top 10 that I see most often in literature and in life. I often teach a variety of grades (10th-12th), but have never had an issue with using the same list for all classes. It has always worked out well for me. I try to get the same amount of words from each class to be fair. After I have the vocabulary list all nice and neat (remember the students did the work), I project the vocabulary list of the week up on my board, and students copy the information. Since they aren't hand-writing these, I want them to do something with them, so I make them color-code the context clues in the sentences. I label each week's words a different color. 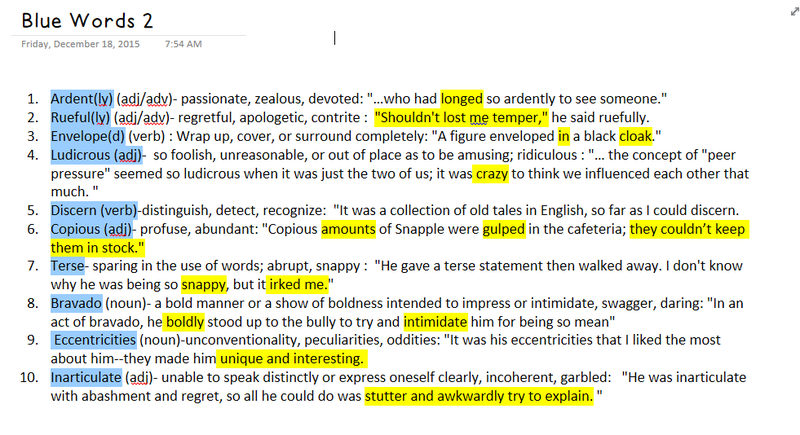 For example, Red words 1 (I also color-code my Onenote notebook for an easy way to organize) More on why I color-code in a minute. This is what my student's notebook looks like after they have highlighted the context clues. Students review words with partners or play a game such as Kahoot, Quizlet, or ball toss (toss the ball and the catcher must call out the correct definition or they are out). I especially love using Quizlet because I simply copy and paste the words by using the "import" function (i.e. less work for me). 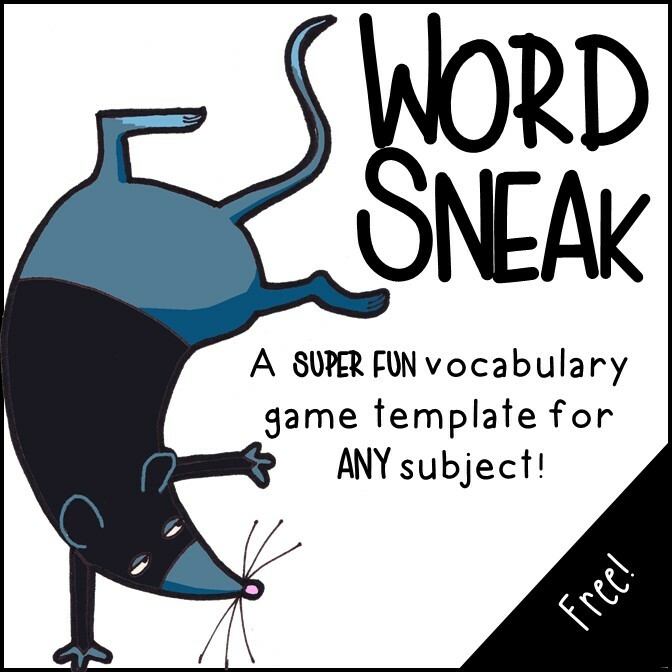 So, anyway, watch this clip to get an idea of the game then download my FREE game template here to play! Vocabulary Bingo: Students draw 9 boxes (3 across and 3 down) and put the new set of words in the boxes. When you build your wall up, you can use more colored sets. For example, I say, "9 boxes with any blue or red word." Once they have their boxes made, I make up sentences and have students put an X on the word that fits with the sentence until someone gets a bingo. I have a little box full of candy and toys for the winners. I'm always surprised how much big kids like toys like these! * The fly swat game. I have two fly swats and make a bracket with 8 teams (I just have my students number off to 8). The teams go up against each other until the bracket gets to a winner. The first person to swat the correct word on the wall gets to move up the bracket. I do single elimination so this game doesn't take too long. *Quizlet Live. This is my students' new favorite game!!! *Others mentioned above such as ball toss, word sneak, Kahoot or bingo. I use sentences with context clues for my quizzes. Since we practice highlighting context clues on Tuesday, this really helps them to search for these on the quiz. I differentiate by highlighting the context clues for certain students. *As you can see, having a color-coded visual of words makes it extremely easy for teachers and students to constantly review new words. *If you are trying to add more Greek and Latin words into your curriculum as I am, you can focus on a root a week and have students try to find these roots in their reading. You can also add quiz questions regarding these roots. 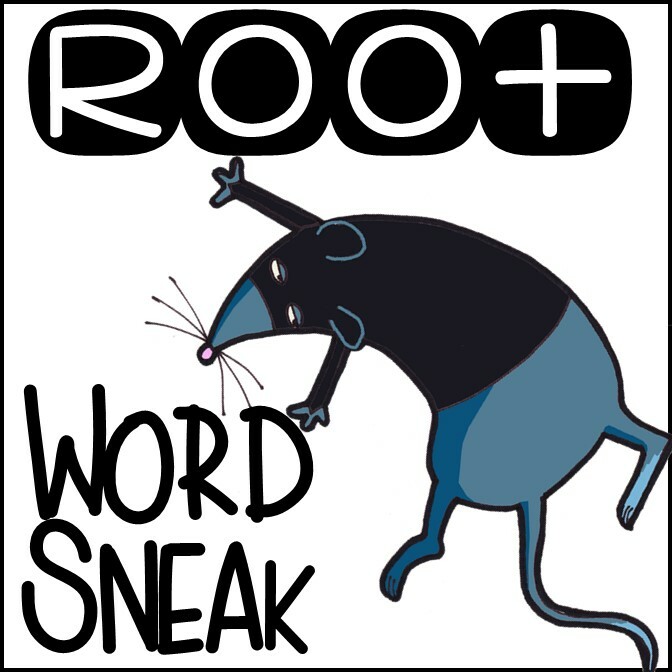 Check out my Root Word Sneak game here! 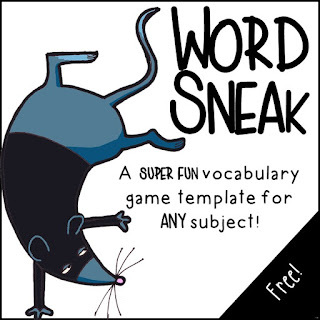 *Word Walls set the atmosphere for easy, no-prep games to add fun to your classroom. 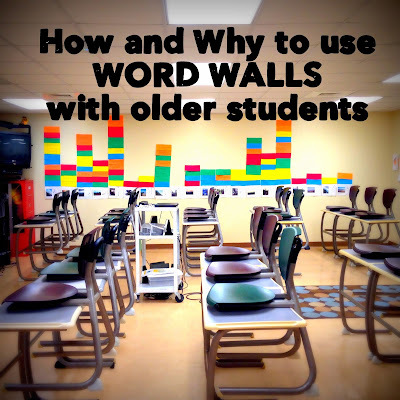 *Students love being able to look at this wall and add words to their writing (I always put a huge smiley face when I see a word wall word used in student writing). *Students take ownership of their vocabulary instruction. *It helps set a routine for your class which is very beneficial for behavior problems. *It promotes free-choice reading. 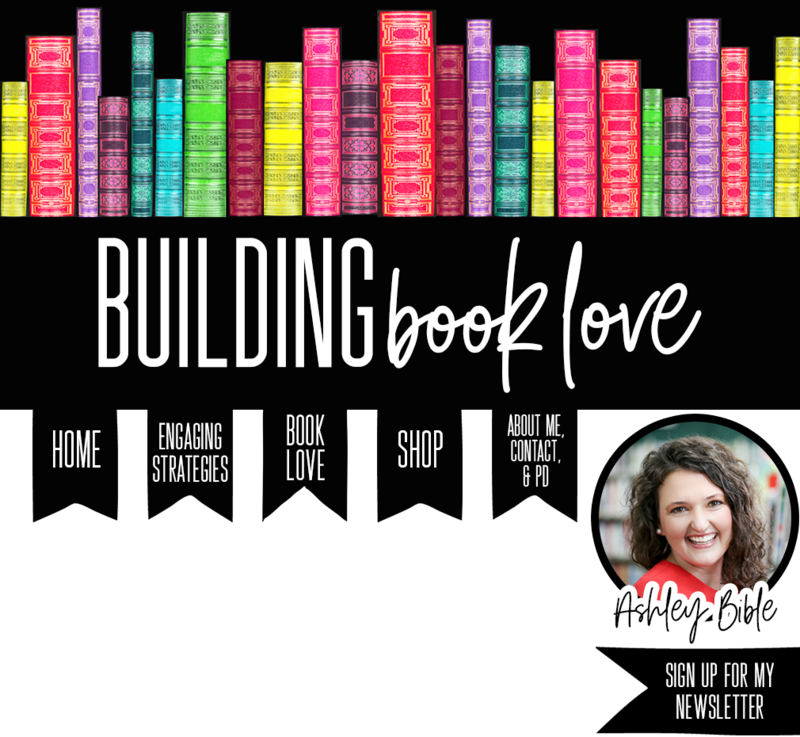 We do a book project every 9 weeks, and it's the best day of the year. I absolutely LOVE the creative projects my students come up with. Want to get a FREE download for my Fun Foodie Book Project Choices? Sign up for my newsletter to receive your free download! Want more teaching and time-saving tips? Be sure to follow me and sign up for my newsletter using the prompt above! Thanks for this thorough explanation. I wish all links were as thorough. I imagine your classroom is extremely organized, a great environment for learning, and fun! Thank you so much for sharing this! Wow, I am impressed! I love the thoughtful integration of everything in your classroom. I have tried some of these in my Spanish classroom, but I did them individually, and I can see that your planning and ideas flow much better. I read tons of blogs, and your posts stand out to me because they are so clear, concise, uncluttered☺ and most importantly practical. THANK YOU!!! Wow! What a tremendous compliment! Thank you so much! Thank you for this! I am great at teaching reading and writing, but I have struggled with ways to incorporate vocabulary in a meaningful way. I love this though! I downloaded the template...does it just cover 4 words or am I looking at it wrong? Great ideas. 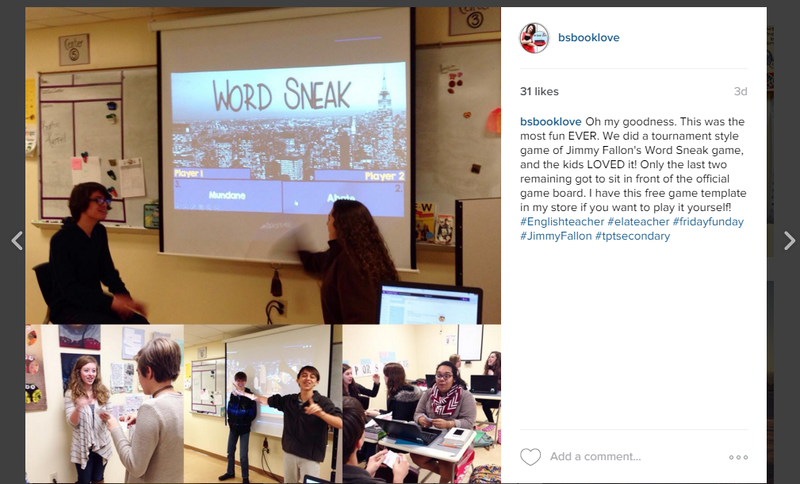 Can't wait to try Word Sneak in my social studies classroom. Maybe I missed it, but how do you assess the kids on the words (or do you)? have you noticed if this helps the kids retain the meanings of words more, or do you see these words pop up in their writing more? Very interested in how you see the benefits to your students. Great question! I give a quiz each Friday. 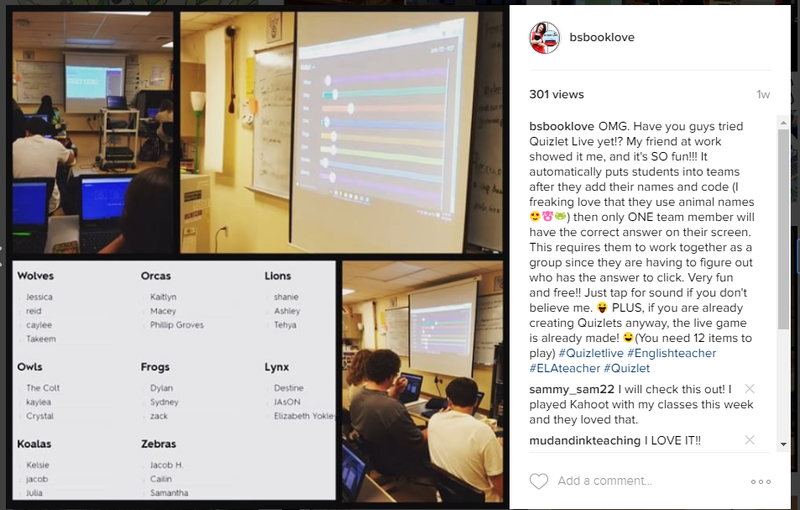 I talk about how I set the quizzes up at the end of this post. Constantly reviewing for SURE helps them to retain better. It always makes me smile when I hear them say "I never noticed this word but now I see it all the time in random places" :) I also challenge my students to use the words in their writing and I make sure to put a big smiley face or give extra credit when they do it without my promoting! I envy your 90 minutes of class time everyday! I only have about 55, which I am still grateful for. Since the students gather the words one week and you review and quiz the next week, you then have a new set of words every other week? Thanks! These are such great ideas! I can't get OneNote to cooperate and download the interactive vocabulary activites template. Is there a trick to this? wow !! Your sharing has helped me a lot in teaching, you always have great ideas, I love them! I read this article in which you give the short gathering of this band. The band is working so unprecedented and they both are to a great degree sensitive and they are working so well. This go here more in this year and bring an option that is other than what's normal. Teaching big children is more easy then the prep school. Students can undersatnd and can improve vocabulary by using word wall and can create more ideas to enhance the knowledge.